The ED left for London while I was at the Dublin Horse Show. 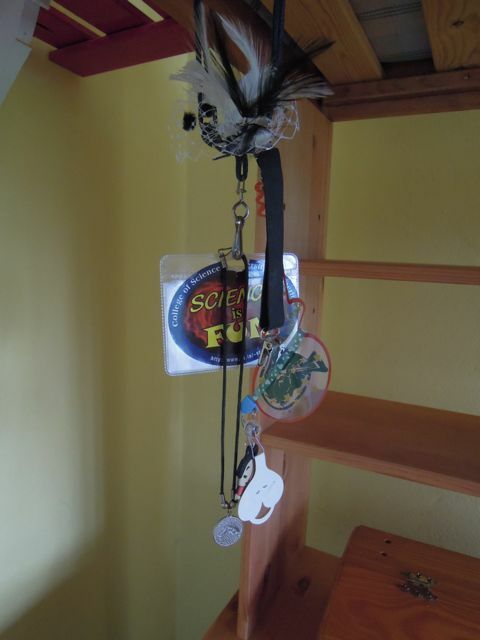 She's done a great job clearing out her bedroom, and I'd seen it in a fairly empty state before I went away, so I was not at all prepared for the lump that rose in my throat when I went in to clear it out for painting. 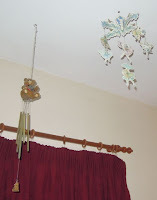 There are still a few bits of her left - wind chimes, a fairy mobile, her name painted in an Oriental style - enough to tug at the heart strings, but I pushed those feelings down deep and soon forgot about them while we painted. The YD works and lives in town now, but she has been home as often as she can, chipping away at clearing her room. Progress has been slow and the deadline is looming, so today I went in, prepared to blitz the final bits and pieces. It was much, much harder than I expected. So many memories, so much stuff charting her progress from two to twenty two. The tasseled blanket, that used to be in the cot, now draped over the cushions in her little sitting area. 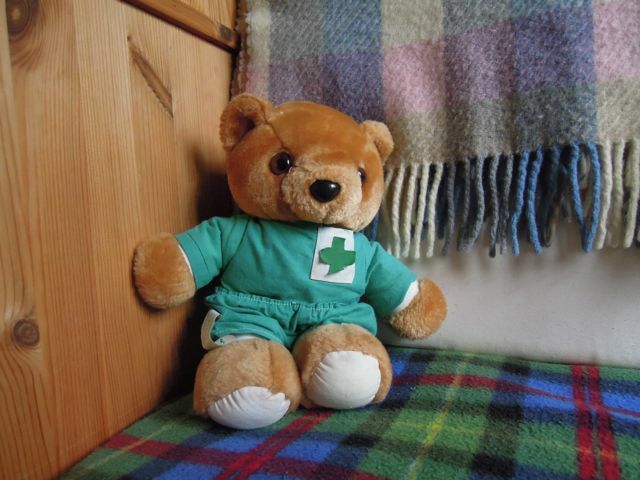 Dr George Clooney Bear, who arrived on the scene complete with surgical mask and stethoscope when she was fighting a horrible flu. A sticker proudly proclaiming "I got my ears pierced at Claire's Accessories." 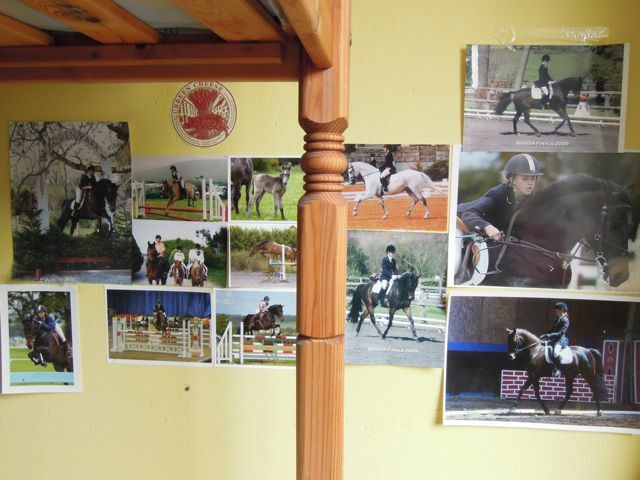 Her wall of photos, full of reminders of great days out, Pony Club, show-jumping, dressage and more. 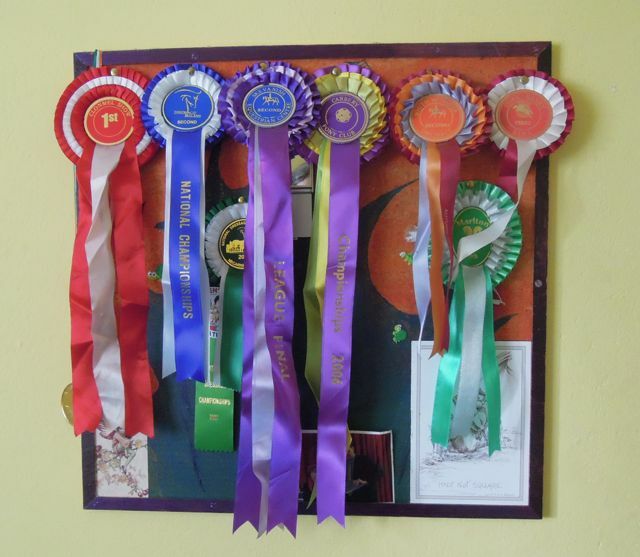 Rosettes and more rosettes - these are just a few of the special ones! 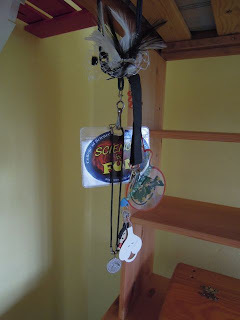 A "Science is Fun" name tag from the Young Scientist fair she attended aged sixteen. An empty Ann Summers box. An empty Ann Summers box? No, scratch that, I don't want to know! Job done, room sorted and ready for inspection. Eyes dried now. 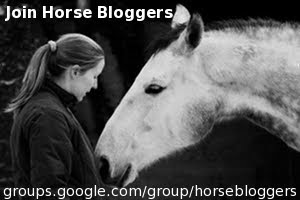 Don't show her this blog! 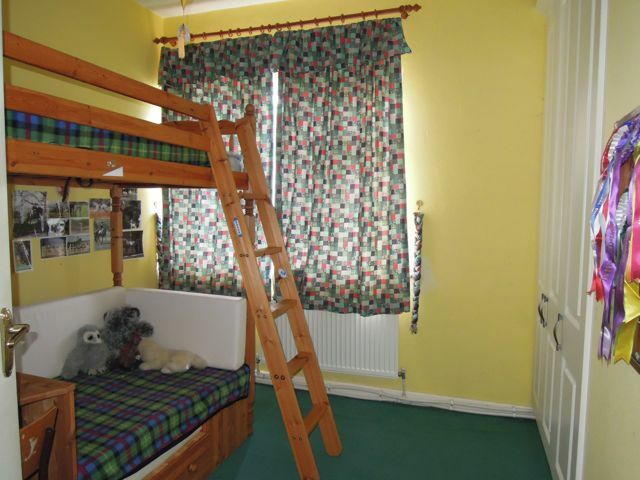 I went into my son's room the other day and even though I don't think he'll ever be back, living there, and the color of the paint is a god-awful neon orange-yellow that he picked, I couldn't bring myself to think about changing it. Thanks for the "gentle" reminder on the boots for jumping. Duh. I have boots; I just did a total brain fart and forgot. It's hard to see them go isn't it. You'll get used to it though it will take some time. I still have lots of boxes in the basement that I'm waiting for them to clear out. Boxes and boxes of Bryer horses, drum sets etc. I'm sure they will be back to visit often. Well, I'm off to babysit my two granddaughter's today. They're so much fun it's almost like having my girls little again. It's all happening very soon. How exciting and how exhausting. You will be emotionally and physically drained I am sure when it is all done. Best of luck! My duaghter's room looks like that now, horse photos and rosettes. Wonder how many years it'll be before I'm packing it all away......? You've a while to go yet, Helen! You're just starting the FUN stage! Excited (and slightly jealous) to watch your French adventure unfold! Thanks, Corinna. I love the photo of the board, and also the photo or the "wall of photos." Maybe I will merge the two, somehow.